The quiet beaches and quaint towns along the coast of Normandy France are a perfect place to prance and pause. 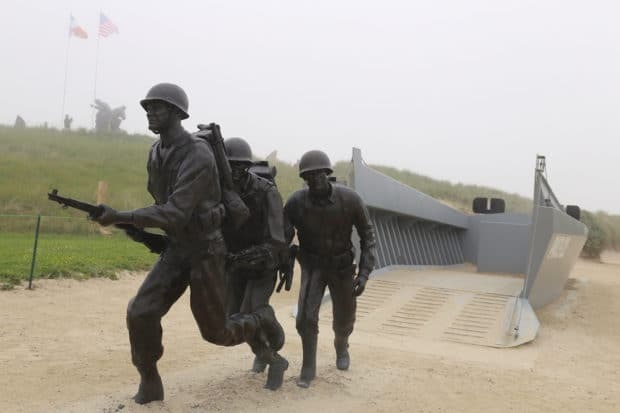 Millions of tourists visit the region each year with a peak appearing during the week of D-Day (June 6th) when veterans, their families and curious tourists tip toe through museums and memorials which pay homage to the brave freedom fighters of WWII. 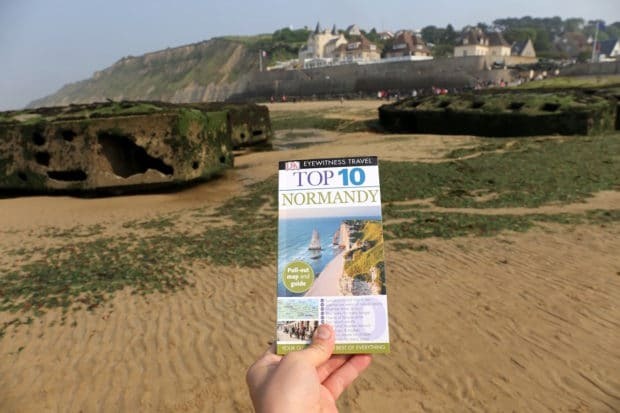 Once I finished mapping out the destinations I’d be visiting with Liberation Route Europe I grabbed a copy of Eyewitness Travel Top 10 Normandy to flush out the rest of my itinerary. The compact sized book is full of useful tips and easily slips into your pocket while meandering through museums. Each of the chapters lists the Top 10 things you should experience at a particular attraction so if you’re time crunched or don’t want to miss out on exploring a museum’s star attraction it’s an invaluable resource. The first few chapters of the book are dedicated to the Top 10 most visited attractions in Normandy while the remaining offer niche lists which are handy for those who have unique interests. Examples include Culinary Highlights, Norman Abbeys and Artists in Normandy. Traveling through Normandy today is an emotional adventure where you’ll often find your eyes filling with tears and lips trembling. It’s a challenging but essential experience that allows one to forever appreciate the great sacrifice made on D-Day. It’s important to liven up the mood on a road trip of Normandy (a full day spent exploring war relics can start to get you down) so be sure to enjoy all the region has to offer including ancient abbeys, top notch culinary offerings (home to camembert, cider and calvados), Monet’s Giverny in full bloom and jaw-dropping architectural marvel Mont-St-Michel. The remains of the artificial Mulberry Harbour make a startling sight – a testament to the ingenuity of Winston Churchill, who realized that if the troops wanted to land, they would have to bring their harbours with them. Visitors today can stroll along the beach at low tide and even climb up on the seaweed adorned remains of Arromanches haunting man-made harbour. The Juno Beach Centre is Canada’s WWII museum which pays homage to the 45,000 Canadians who lost their lives during WWII, of which 5,500 were killed during the Battle of Normandy and 359 on D-Day. The JBC opened in 2003 in collaboration with veterans and volunteers who had a vision to create a permanent memorial to Canadians freedom fighters. 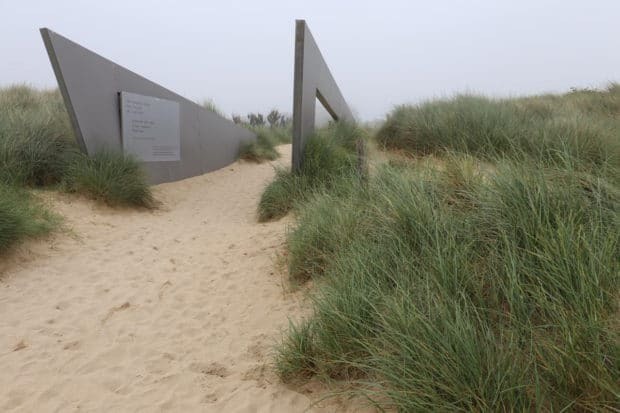 Designed by Canadian architect Brian K. Chamberlain, the Juno Beach Centre is intended to establish a distinctly Canadian presence on the Normandy coast. It features a central pentagon shape surrounded by a series of multi-level, interlocking sections with sloping walls. The resulting building lines reflect the pentagon shape of the Order of Canada and the outline of the maple leaf, the national emblem. The permanent exhibit tells the story of the Canadians who volunteered for military service or mobilized their energies, skills and resources at home, thereby contributing greatly to the war effort. It also presents the battles that took Canadian units from Sicily to Italy and from Normandy to the Netherlands. The exhibit draws upon documents, photographs, audiovisual and audio documents, multimedia, maps and artefacts that alternate between areas of emotion, reflection and discovery. Every year on D-Day many Canadians visit the JBC, strolling along the beach before attending an emotional hour long Commemorative Ceremony. 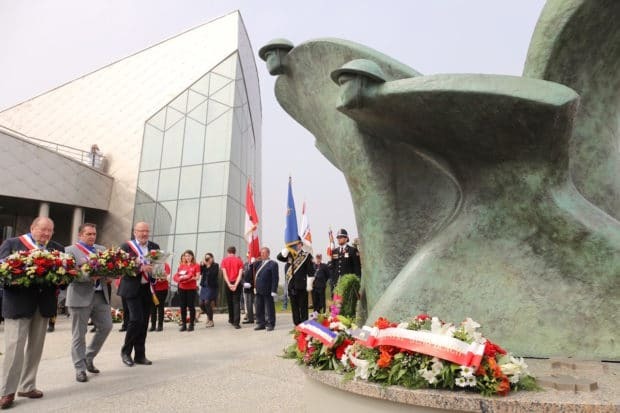 I attended the 72nd anniversary which featured speeches by Colonel Guy Maillet from the Embassy of Canada in Paris, Frederic Pouille the Mayor of Courseulles-sur-Mer and Don Cooper the President of the Juno Beach Centre Association. The tear filled event included a heart felt thank you to attending veterans, Minute of Silence, Laying of Wreaths and trilogy of national anthems performed by a local brass band featuring La Marseillaise, God Save the Queen and O Canada. “Within sight of this house over 100 men of the Queen’s Own Rifles were killed or wounded, in the first few minutes of the landings.” That stark inscription welcomes visitors at the entrance of a large, timber-framed house overlooking Juno Beach, in the village of Bernières-sur-Mer. La Maison des Canadiens, or Canada House, is one of the most iconic buildings in Canadian military history. 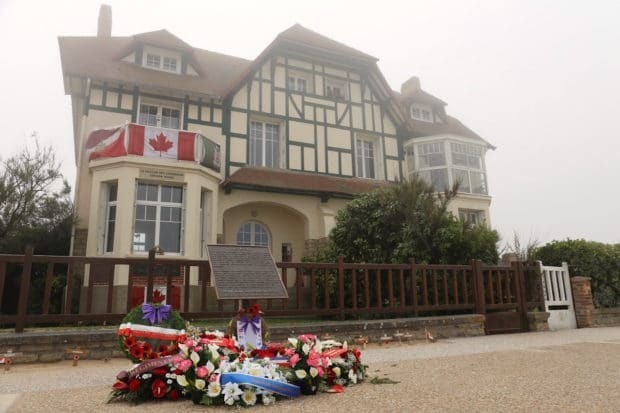 It was one of the first houses liberated by Canadian soldiers on D-Day, 6 June 1944, and has since become a familiar historic landmark, standing in the backdrop of the many black-and-white photographs showing troops landing on the sands of this village in Normandy. Built on the very beach where the first American troops landed on D-Day, the Utah Beach Museum recounts the story of D-Day in 10 sequences, from the preparation of the landing, to the final outcome and success. The comprehensive chronological journey immerses visitors in the history of the landing through a rich collection of objects, vehicles, and oral histories. 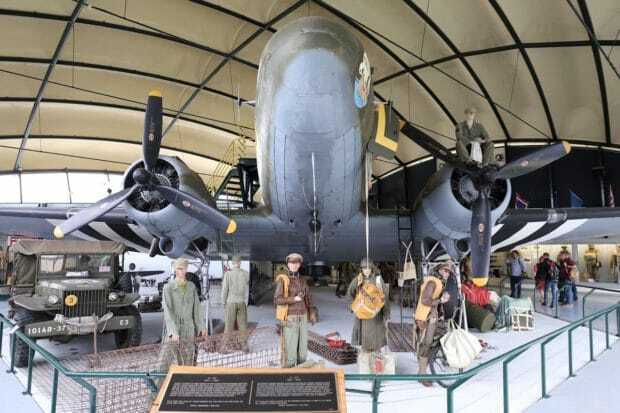 Entirely renovated in 2011, the Utah Beach Museum D-Day Museum now houses one of the world’s last remaining B26 “Marauders,” the legendary bomber that would prove to be one of the keys to victory on D-Day. The Normandy American Cemetery and Memorial is located on the site of the temporary American St. Laurent Cemetery, established by the U.S. First Army on June 8, 1944 as the first American cemetery on European soil in World War II. 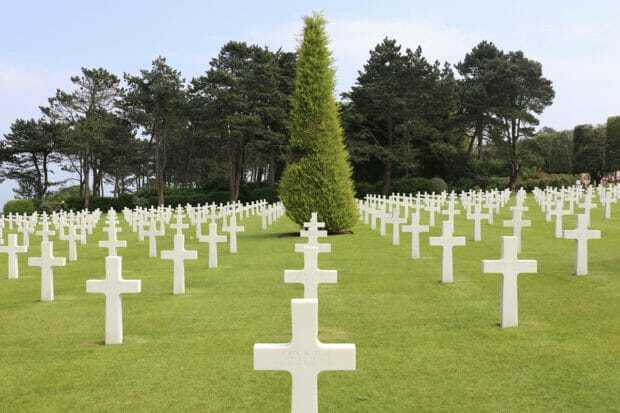 The sprawling cemetery site covers 172 acres and contains the graves of 9,387 military dead, most of whom lost their lives in the D-Day landings and ensuing operations. Afters strolling past thousands of graves take a moment to pause in front of a spectacular statue described as, “the spirit of American youth rising from the waves.” The black statue sprouts within the Walls of the Missing, a semicircular garden where visitors can read 1,557 soldiers names who were never found after the war. 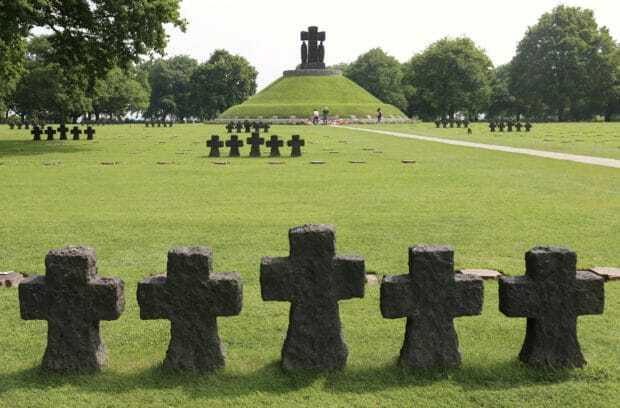 The Germany War Cemetery is a military war grave cemetery, located close to Bayeux. Presently containing in excess of 21,000 German military personnel of World War II, it is maintained and managed by the German War Graves Commission. Visitors can view a permanent exhibition about the German War Graves Commission and have access to a database to locate the graves of dead German soldiers. An adjoint peace-garden with 1,200 maple-trees symbolizes that peace ought to grow. 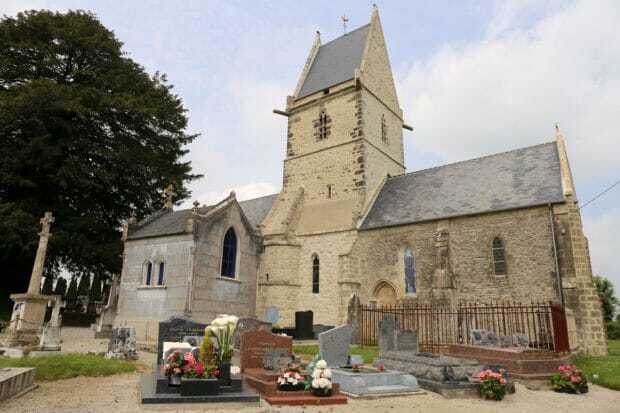 Angoville-au-Plain is home to a church that was used by 2 US Army Medics as an aide station during the Battle of Normandy. Robert Wright and Ken Moore of the 101st Airborne treated a mix of 80 injured American and German wounded soldiers and a child. Today it’s a popular spot for war historians to visit as blood stains are still visible on the pews and two stained glass windows commemorate the medics and parachutists who used this sacred place as a safe haven during the war. Shaped like a parachute, the Airborne Museum in Sainte-Mere-Eglise commemorates the American paratroops that dropped behind Utah Beach. Fun Fact: the museum faces the church where parachuter John Steele was famously caught, hanging from a bell tower by his parachute. Visitors to the museum are offered an education on the invasion preparations in England, through to the battles for liberation. Highlights include a rare WACO glider, massive C-47 plane that participated in the events of June 1944 and a reenactment of General Eisenhower visiting paratroopers of the 101st Airborne Division on June 5th at an airfield in England (thanks to a parade of dapper mannequins). 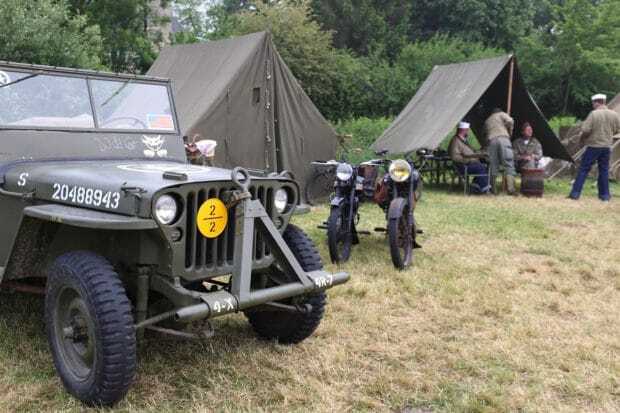 If visiting Normandy during D-Day you’re certain to feel as though you’ve stepped back in time as hundreds of military enthusiasts from around the world pitch their tents in the countryside to form reenactment camp’s. If you have an opportunity to stroll through you’ll find vintage tanks and motorcycles, refurbished military Jeep’s and even a communal canteen where members of the temporary village dressed in their best military uniforms enjoy a swig or two of beer in the hot heat. Pointe du Hoc is a promontory with a 100 ft cliff overlooking the English Channel. During WWII it was the highest point between Utah Beach to the west and Omaha Beach to the east. The German army fortified the area with concrete casements and gun pits. 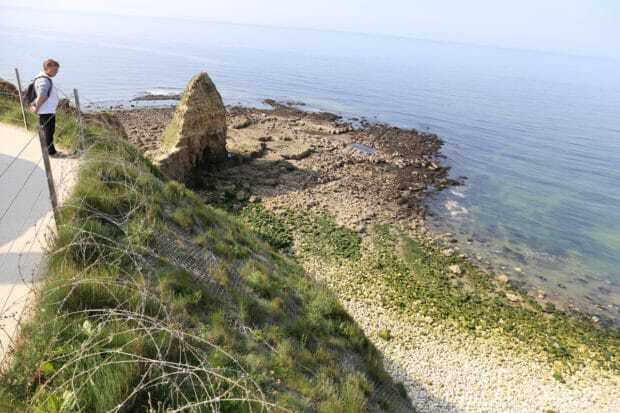 On D-Day the US Army Ranger Assault Group assaulted and captured Pointe du Hoc after scaling the cliffs. Today the area has been preserved as it was at the end of the fighting and features a memorial and museum dedicated to the battle. Many of the fortifications have been left in place and the site remains speckled with a number of bomb craters. Wow Andrew! Well done! Thank you for your research and sharing! You are contributing to the rememberance of the price paid for our freedom! Thanks was an unforgettable trip!